According to data by Eurostat, the proportion of live births which occurred outside marriage in the EU stood at 43 percent in 2016, just over 15 percentage points above the value recorded in 2000. In 2016, 31.3 percent of births in Romania occurred outside marriage, compared to 25.5 percent in 2000. Starting in 2000, the share of births occurring outside marriage steadily increased by around 1 percent each year, signalling changing patterns of family formation, with births occurring in non-marital relationships, cohabiting couples and to lone parents. There are 8 EU states where there were more births outside marriage than within marriage in 2016: France (60 percent), Bulgaria and Slovenia (59 percent), Estonia (56 percent), Sweden (55 percent), Denmark (54 percent), Portugal (53 percent) and the Netherlands (50 percent). In contrast, more than 80 percent of live births in Greece, Croatia and Cyprus occurred within marriage. 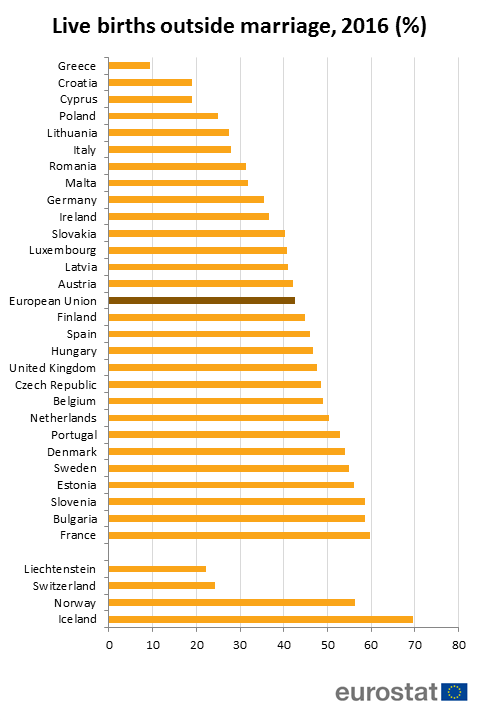 Between 2015 and 2016, extramarital births increased in almost every EU country except Estonia, Italy, Latvia, Lithuania, Hungary and the United Kingdom, while in Bulgaria and Ireland there was no variation. The post Eurostat: 31 pct of births in Romania occurred outside marriage in 2016, below EU average of 43 pct appeared first on Business Review.